South Africa has one of the longest sequences of human development in the world. It begins with two million years old hominid fossils. South African scientists have been actively involved in the study of human origins since 1925 when Raymond Dart identified the Taung child as an infant halfway between apes and humans. Dart called the remains Australopithecus africanus, southern ape-man, and his work ultimately changed the focus of human evolution from Europe and Asia to Africa. In many ways this discovery marked the birth of palaeoanthropology as a discipline. Today, we know that australopithecines represent the first human ancestors to walk upright, and they are only found in Africa. In South Africa, scientists usually find australopithecine remains in breccias in dolomite. The majority were found through lime mining activities near Johannesburg (lime was used to process gold at the end of the 19th and beginning of the 20th centuries), and most line mines here have exposed some breccias. This dolomite band contains some of the best-known australopithecine sites in the world. Kromdraai, Swartkrans and Sterkfontein, for example, appear in every major textbook on human origins. Because of its richness, a large portion of the fossil-bearing zone has been listed as a World Heritage Site, known as the ‘Cradle of Humankind’. Recently, a new find from the Cradle has made world headlines. Lee Berger and his team found the extraordinarily well-preserved remains of a juvenile male and adult female of a new species, Australopithecus sediba. The hominids had fallen down a deep sink hole and were then covered by calcified sediment in an underground pool. The sediment dates to between 1.78 and 1.95 million years ago. Visit www.wits.ac.za for images and more information. Although many specimens have been found in breccias, australopithecines did not normally live in caves. They probably slept in the tropical forest galleries that stood along the river banks. They were probably omnivorous, eating mostly plants and some meat, somewhat like chimpanzees. Their bones ended up in the dolomite caves because they were hunted by leopard, hyena and sabre-toothed cats which did use caves, or by accident, as in the case of the recent discovery. Museum displays on human evolution are open to the public at Maropeng, on the edge of the World Heritage Site, and at Sterkfontein. Some hominids began to manufacture stone tools about 2.6 million years ago, thus beginning the Earlier Stone Age (ESA). Known as the Oldowan industry, most of the earliest tools were rough cobble cores and simple flakes. The flakes were used for such activities as cutting meat and skinning animals. At present, it is unclear which hominids made Oldowan tools. Many scientists believe Homo habilis produced them. Sterkfontein is one of the few sites anywhere to yield an in situ assemblage of Oldowan tools. This rare occurrence further increases the importance of the World Heritage Site. By about 1.4 million years ago, hominids started producing more recognizable stone artefacts such as handaxes, cleavers and core tools. Although serving many purposes, these Acheulian tools were probably designed to butcher large animals, such as elephants, rhino and hippo, which had died of natural causes. Because these animals were particularly dangerous, hominids were probably not yet able to hunt them. At this time, then, our ancestors were most likely specialized scavengers. Such scavenging yielded enormous amounts of protein which was critical in the evolution of the human brain. The hominids that made Acheulian tools can confidently be identified as Homo ergaster (formerly called Homo erectus). Acheulian artefacts seldom occurred in cave sites until the end of the Earlier Stone Age (from about 400,000 to 250,000 years ago), but some have been found at Sterkfontein and Swartkrans. Most Acheulian material is found outside caves because our ancestors had not yet mastered fire. One exception appears to be Swartkrans, but the date of some 1 million years ago is controversial. Whatever the date, the controlled use of fire had certainly been mastered by the Middle Stone Age. The repeated use of caves by 250,000 years ago, the beginning of the Middle Stone Age (MSA), indicates that our ancestors had developed the concept of a home base and hearths show that they could make fire. Furthermore, tool kits included prepared cores, parallel-sided blades and triangular points. These points were hafted to make spears used to hunt large grazers such as wildebeest, hartebeest and eland. By this time, then, our ancestors had become accomplished hunters. These early hunters are classified as archaic humans. By 100,000 years ago, they were anatomically fully modern. The degree to which their behaviour was equally modern, however, is still under investigation. Indeed, the MSA is particularly important today for this study. Fully modern human behaviour, such as abstract thought, complex politics and kinship systems, requires the use of true language. Other animals communicate, but only humans have the ability to string together sounds in unlimited combinations. Unfortunately, archaeologists can not study directly abstract thought, kinship systems or language. This is why small artefacts are so important. Among other artefacts, compound tools, such as hafted harpoons and compound glues for hafting spear points, indicate complex thought. Evidence for these cognitive advancements comes from Sibudu Cave near Durban and Blombos Cave in the Cape both dating to about 70 000 years ago. These were important steps in the cultural evolution of humanity. In addition, the widespread use of red ochre, presumably as body paint, also shows that MSA behaviour had become more human. The recent finds of decorated ochre at Blombos and decorated ostrich eggshells at Diepkloof, also in the Cape, further demonstrates this point. Important displays of MSA artefacts are open to the public at the Iziko Museum in Cape Town and the Origins Centre in Johannesburg. By 25,000 years ago and the beginning of the Later Stone Age (LSA), archaeological deposits contain a diagnostic tool kit that includes small scrapers and segments manufactured from fine-grained materials. By this time, LSA peoples were hunting small game with bows and poisoned arrows. Furthermore, the numerous shell middens which dot the coastline in the Cape attest to the exploitation of marine resources at different seasons. In addition to bow hunting and shellfish collection, human behaviour was recognisably modern in other ways. Uniquely human traits such as rock art and purposeful burials with ornaments were a regular practice. In southern Africa these people were the ancestors of the San (or Bushmen). San rock art has a well-earned reputation for aesthetic appeal and symbolic complexity. David Lewis-Williams and his team have been able to unravel this complexity, at least in outline, through the careful use of some 13 000 pages of text recorded in the late 19th century in English and the San language. Rather than a record of daily life, the art is essentially religious. Among other aspects, it expresses beliefs about the role of shamans (medicine people) in controlling rain and game, and in healing through the famous ‘trance dance’. Trance images figure prominently, along with animals of power, such as eland, elephant and rhino. Visit www.sarada.co.za for images and more information. Overall, southern Africa probably has the largest corpus of rock art anywhere in the world, and the Drakensberg contains some of the finest. Because of its richness, it is part of the Ukahlamba-Drakensberg World Heritage Site. Important examples of engravings and paintings are on display at Iziko Museum, Cape Town, the Natal Museum, Pietermaritzburg, and the Origins Centre, Johannesburg. Various cave sites are also open to the public in the Cape. Visit www.cllp.uct.ac.za for more information. The relationship between San hunter-gatherers and Khoekhoe pastoralists is the subject of current research. This question is of interest because it was the Khoekhoe who first traded cattle to the Cape Dutch in the 17th century. The main question concerns Khoekhoe origins: some believe they were local hunter-gatherers who acquired sheep and cattle, while others think they brought domestic animals with them from East Africa. Ultimately, the answer will involve linguistic and genetic data as well as archaeology. Both San and Khoekhoe were in southern Africa when the first Bantu-speaking farmers arrived about 2000 years ago. According to historical linguistics, the Bantu language family originated in West Africa, along the border of present day Nigeria and Cameroon. Generally, the evidence suggests that between 200 BC and AD 200 the ancestors of Eastern Bantu-speaking people moved out of this homeland into East and Southern Africa. These people cultivated sorghum and millets, herded cattle, sheep and goats and manufactured iron tools and copper ornaments. As a rule these homesteads were sited near water and good soils that could be cultivated with iron hoes. Because metalworking represents a totally new technology, some archaeologists call this period the Iron Age. The first 900 years are known as the Early Iron Age (EIA), while the people themselves are sometimes referred to as Early Farming Communities (EFC). As agriculturalists, these farming people lived in semi-permanent homesteads comprising pole-and-daga (wattle and daub) houses and grain bins arranged around animal byres. This arrangement, known as the Central Cattle Pattern, was characteristic of Eastern Bantu speakers who preferred cattle for bride wealth, traced their blood from their father, practised male hereditary leadership and had a positive attitude about the role of ancestors in daily life. One EFC settlement near Lydenburg yielded artefacts related to the spiritual world. Seven ceramic heads had been deposited in a deep storage pit some 1200 years ago. These helmet sculptures each had eyes, a mouth and other human-like features. Two were large enough to cover a person’s head, but the others would have been mounted on poles. These sculptures were most likely used in initiation ceremonies of some sort. Replicas are on display at the Lydenburg Museum and the originals are at the Iziko Museum in Cape Town. Throughout the Iron Age, climatic fluctuations played a significant role in structuring human geography. When EIA people first entered southern Africa, the climate was warmer and wetter than today. Between about AD 700 to 900 the climate was colder and drier than at present, and EIA farmers would have retreated to more optimal areas. The climate became better again sometime during the Middle Iron Age, between AD 900 to 1300. At about AD 1700, however, the ‘Little Ice Age’ reached its nadir, and its impact upon human population was particularly severe. Besides these changes, Iron Age farmers had to contend with unpredictable droughts. When the droughts were particularly severe, from 3 to 5 years in a row, rainmakers would perform special rituals on special hills, and the common people would follow with various cleansing rituals. Evidently, some people had to burn their grain bins down and build new ones on top. These burnt structures are not as common as archaeologists once thought, and they can now be used as a cultural proxy for severe drought. The ultimate cause of the droughts was probably El NiÁ±o-Southern Oscillation (ENSO) activity because this is the most important mechanism driving climatic variability in the Southern Hemisphere. According to data from South America, ENSO activity was particularly frequent during the last 2500 years. Climate and geography played a significant role in the development of greater social complexity in the Limpopo Valley. Located at the junction of Botswana, Zimbabwe and South Africa, the Shashe and Limpopo rivers became the ‘Nile of South Africa’ during the Middle Iron Age. Regular flooding at this time made intensive agriculture possible. The resultant population increase, along with surplus trade from the Indian Ocean gold and ivory trade, led to the development of marked social classes and sacred leadership at Mapungubwe. As a result, Mapungubwe was the first indigenous civilisation in southern Africa, predating even Great Zimbabwe. The famous gold rhinoceros from Mapungubwe is a national icon and the inspiration for South Africa’s highest civilian award. Because of its significance to African prehistory in general, the Mapungubwe landscape became a World Heritage Site in 2003. The landscape is also a National Park and accessible to the public. Its new interpretive centre won an international prize. Treasures from Mapungubwe are also on display at the Mapungubwe Museum, University of Pretoria. Another facility in Pretoria, the National Culture History Museum, displays a large number of clay figurines from an early initiation site near Mapungubwe. Shortly after the abandonment of Mapungubwe (about AD 1300), the ancestors of the present day Sotho-Tswana moved south from East Africa. Archaeologists have recorded the earliest Sotho-Tswana sites, characterized by a ceramic style called Moloko, in the Limpopo Province. Somewhat later, Sotho-Tswana people moved south into a large part of Gauteng and the Northwest Province. About 100 years earlier, the ancestors of Nguni-speaking people had moved from East Africa into the KwaZulu-Natal region. These Late Iron Age farmers left huge numbers of stonewalled settlements throughout South Africa. Southern Nguni built the first stonewalling in about AD 1300 in the Midlands of KwaZulu-Natal. Known as Moor Park, this first walling stands in defensive positions on hilltops and spurs. The front-back orientation of these settlements conforms to the shape of the terrain. Somewhat later (about AD 1450), a few Northern Nguni moved up onto the Free State highveld and built circular settlements. The best known are near the hill Ntsuanatsatsi (the legendary place of origin of the BaFokeng), which has given its name to the walling type. Somewhat later still, these Nguni people moved across the Vaal River into the hilly areas of Gauteng and the North West Provinces, introducing the practise to Sotho-Tswana people. By the late 18th century, Western Sotho-Tswana had created the Molokwane type, best known from the site with the same name west of Rustenburg. Some Molokwane settlements were huge aggregations, housing up to 20 000 people. From this time on, urban settlements became characteristic of Sotho Tswana life. The huge Sotho-Tswana settlements were also a characteristic of the unusual period known as the difaqane (or mefacane) ”• the time of trouble. The causes of the difaqane are controversial. Formerly, historians began the period in 1821 when the Hlubi moved out of KwaZulu-Natal and attacked the Tlokwa on the plateau. In this interpretation, Shaka of the Zulu was one of the prime causes. Recent work, however, has shown that Shaka was a result, not a cause, and that causal processes had began a few decades earlier among the Sotho-Tswana as well as Nguni. The causal processes included an extended period of high rainfall, the introduction of maize and consequent population increase, competition for the ivory trade in the Sotho-Tswana area, competition for cattle in KwaZulu-Natal, hunting on horseback with guns in the Karroo and finally, a serious drought that lead to an agricultural collapse. Oral traditions of widespread famine, cannibalism and total annihilation of enemies at this time indicate an ecological imbalance between people and resources. In response to this chaos, Sotho-Tswana tended to live on hilltops and aggregate into large settlements for mutual protection. These defensive moves may have begun as early as 1780. At about 1826, Mzilikazi moved into the Magaliesberg to escape Shaka. Mzilikazi’s entry into Gauteng marks the beginning of the Historic Period. Mzilikazi established his first headquarters in the Heidelberg region and then moved further west somewhere near Pretoria. With a large and powerful force, he defeated, subjugated or absorbed local Sotho-Tswana. In about 1830, the Zulu attacked Mzilikazi, so he moved his headquarters west near Zeerust. Thus, Mzilikazi only stayed in the Pretoria area for four or five years. Even so, his presence made such an impact that most European landowners in the region credit all stonewalling to him. In both Gauteng and around Zeerust, Mzilikazi had removed enemies and consolidated followers so that he was surrounded by uninhabited land. Consequently, the land appeared empty when Voortrekkers crossed the Vaal in 1836. Ultimately, the Voortrekkers chased Mzilikazi out of South Africa, making it possible for Boers to settle permanently north of the Vaal. • Deacon, H.J. & Deacon, J. 1999. 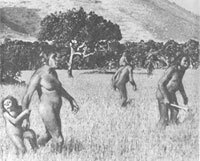 Human beginnings in South Africa. Cape Town: David Philip. • Greenburg, J.H. 1995. Studies in African Linguistic Classification. New Haven: Yale University Press. • Hamilton, C. (ed.) 1995. The Mfecane Aftermath. Johannesburg: Witwatersrand University Press. • Huffman, T.N. 2007. Handbook to the Iron Age. The Archaeology of Pre-Colonial Farmers in Southern Africa. Scottsville: University of KwaZulu-Natal press. • Klein R.G. (ed.) 1984. Southern African Prehistory and Paleoenvironments. Rotterdam: A.A. Balkema. • Kuman, K. 1994. The archaeology of Sterkfontein: preliminary findings on site formation and cultural change. South African Journal of Science 90: 215-219. • Maggs, T. 1976. Iron Age Communities of the Southern Highveld. Pietermaritzberg: Natal Museum. • Mitchell, P. 2002. The Archaeology of Southern Africa. Cambridge: Cambridge University Press. • Pakenham, T. 1979. The Boer War. London: MacDonald & Co. (1982 edition). • Parkington, J. 2006. Shorelines, Strandlopers and Shell Middens. Archaeology of the Cape Coast. Cape Town: Krakadouw Trust. • Phillipson, D.W. 2005. African Archaeology (Third Edition). Cambridge: Cambridge University Press. • Pistorius, J.C.C. 1992. Molokwane: an Iron Age BaKwena Village. Johannesburg: Perskor Printers. • Smith, A.B. 1992. Pastoralism in Africa: Origins and Development Ecology. London: Hurst and Company. • Tyson, P.D. & Lindesay, J.A. 1992. The climate of the last 2000 years in southern Africa. The Holocene 2:271-278. • Wadley, L. 1987. Later Stone Age Hunters and Gatherers of the Southern Transvaal. Oxford: British Archaeological reports, International Series 380.